Police forces in England and Wales should work together more when buying equipment to cut the £1.7bn they spend each year, the government has said. A Home Office study suggests some forces spend much more than others on items such as batons and body armour. Since 2010 more than £200m has been saved through better procurement, but the government said more could be done. But police chiefs warned such savings would not be enough to solve the scale of cuts facing police forces. The study reveals what the police pay for 20 common items of uniform including shirts, high-visibility jackets and helmets, as well as front-line equipment such as batons, handcuffs and vehicles. Forces have streamlined their procurement but the figures show there are still wide variations in spending. Northamptonshire and Staffordshire Police bought batons for their officers costing £82.91 each while South Wales managed to buy them for just £22.99, the study found. Humberside bought police helmets for more than £43 each while most other forces acquired them for under £30. Policing minister Mike Penning said: "For too long the police have approached the market in a fragmented way, buying equipment in small amounts and to varying specifications. "It makes no sense for forces to buy separately when money can be saved if they act together. "This will help the public and police and crime commissioners hold chief constables to account for how they spend taxpayers' money and, crucially, reveal potential opportunities for further savings." Police chiefs and commissioners say the scale of cuts facing police - between 25% and 40% - would not be achieved by cuts in equipment spending alone. 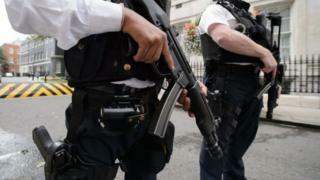 They have warned that the number of officers could be reduced to levels seen in the 1970s. The total police workforce dropped by 36,3672 (15%) between March 2010 and September 2014, and officer numbers dropped by 16,659 (12%) to 127,075. In June the National Audit Office warned that the Home Office had "insufficient information" on how much further it could cut police funding without "degrading services".